California Turns To China For New Bay Bridge American workers will assemble the more than $7 billion San Francisco-Oakland Bay Bridge, but its massive cable, key sections of the iconic tower and deck are all made in China. Lower costs and Chinese expertise are the main reasons, but critics say the decision hurts the state, which is struggling with high unemployment. Catwalks hang over a section of the newly constructed eastern span of the San Francisco-Oakland Bay Bridge in Oakland, Calif.
California is spending more than $7 billion building what it says will be an architectural marvel: the new San Francisco-Oakland Bay Bridge. But the state saved a lot of money sending some of the construction work overseas. The new eastern span of the Bay Bridge will have a distinctive design to rival its more famous cousin, the Golden Gate Bridge. Bart Ney, a spokesman for the project, recently stood near the top of a gleaming white tower, more than 500 feet above the San Francisco Bay. "What we're standing on will be the world's largest self-anchored suspension bridge," he says. A typical suspension bridge is held up by cables strung between two towers like a hammock. This bridge features a single tower and a single mile-long cable that drapes up and over the tower and supports the deck like a sling. The cable is made up of 137 strands of steel. "We will pull those strands across the bay to make this cable," says Ney. "And we keep doing that until we have all of them in place, and then we can start hanging up the suspender wires that hold up the deck." This assembly will be performed early next year by American labor. But the massive cable, key sections of the iconic tower and deck were all made in China, which is emerging as an infrastructure powerhouse in more places than San Francisco. For example, Chinese companies have contracted with New York City for a bridge, the subway system and a commuter train platform. 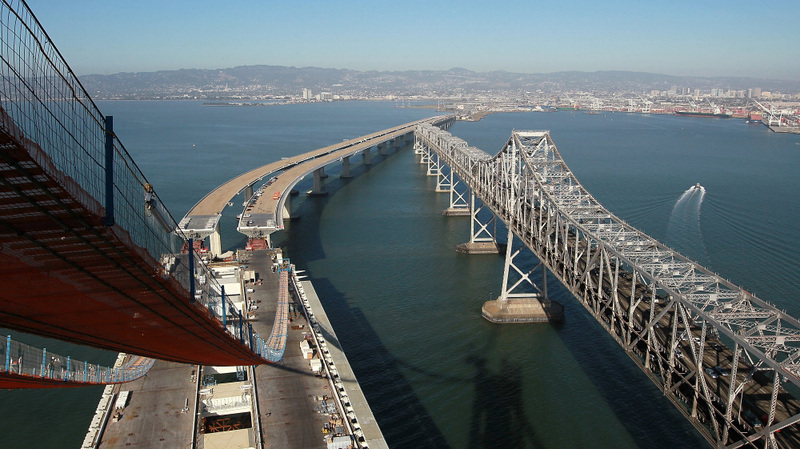 The decision to outsource the fabrication of key sections of the Bay Bridge was made about five years ago, when a contractor offered alternate bids on the project, says Tony Anziano, a manager at the California Department of Transportation. "One proposing to do work domestically, one proposing to do the work internationally: There was a $400 million differential in that bid, and in that case it would have required the work to go international," he says. California avoided legal requirements to use domestic steel by not using federal funds for the job. The steel contract went to a state-owned Chinese company, Shanghai Zhenhua Heavy Industries, which had several advantages: modern production facilities, ships to deliver the steel and, of course, low-cost labor. A Chinese steel polisher makes about $12 a day. When you have a project of that size here in California, it has a multiplier effect. It gives thousands of families those jobs, and then those paychecks and their subsequent spending ends up going back into our economy. And so now all that money has permanently disappeared from California. Bob LaVenture, a district director for the United Steelworkers Union, has opposed outsourcing this job. "There is no way that American workers will be able to ever compete with $12 a day," he says. "It's just not right, and it's not right for America." It wasn't just the cost of labor that made Chinese steel more attractive, Anziano says. He says American steel fabricators don't have the capacity for a job like the Bay Bridge. When union and industry groups questioned the quality of the Chinese steel, Anziano says, the state and the contractor sent more than 200 people to China to watch over the fabrication process. "In this particular case, we had full-time staff on site over in China — 24/7 — that monitored all aspects of fabrication work and performed their own quality-assurance testing," he says. "So we have a very high level of assurance about what we are getting." California Assemblyman Luis Alejo says that even at a savings of hundreds of millions of dollars, the decision to outsource has done more damage to California than it was worth. "When you have a project of that size here in California, it has a multiplier effect," he says. "It gives thousands of families those jobs, and then those paychecks and their subsequent spending ends up going back into our economy. And so now all that money has permanently disappeared from California." California's unemployment rate is 12 percent, well above the national average. Yet when the deal was made for the Chinese steel, unemployment ran at just under 5 percent. If it were still that low now, this debate would likely have less punch.